Great Easter Campaigns for Companies who don’t sell Chocolate! Selling chocolate eggs to the general public at Easter isn’t exactly selling ice to the Eskimos. However, for the businesses who don’t have this delicious advantage, there are other ways of creating effective and fun campaigns to leverage this annual marketing opportunity. Fresh Relevance has collected a few great examples of chocolate-free brands who’ve been creative with their marketing in the last few years. We all like to get away from time to time, and of course Easter coincides with the Easter Holidays (Or Spring break!). Crystal Ski have used this to encourage skiers to get on the mountain with an idyllic description of the potentials of skiing in Spring. This is a classic example where personalized product recommendations can help, showing different types of products to singles vs families. Selling homeware, Williams-Sonoma is well equipped to support the food-related connotations of Easter, with beautiful products that speak for themselves .They have reminded the customer how long they have to prepare (a countdown timer might have been even better suited) and created an enticing offer with multiple options to allow for different buyers needs. Easter fashion is more a subcategory of Spring fashion, and doesn’t hold the same present-giving potential as the infamous Christmas jumper and socks. However, by tying in to Easter/Spring break, Monsoon have added another dimension which gets their fashion line creatively involved. True cycling enthusiasts will take any opportunity to get outside on their two beloved wheels. Not only have Evans Cycle established that they’ll be open and there’s time to have things delivered, they are also engaging their customers and building loyalty by going cycling with them. Another great opportunity for a countdown timer - this time counting down to the shipping deadline. Mini Boden hosted a fun social media competition campaign to get a buzz going. The fun Easter egg hunt paired with a sizeable prize and an increased presence on social media was a great creative way to approach Easter when you don’t have a specific Easter range. As soon as someone sees the word gift, they won’t want to waste it. 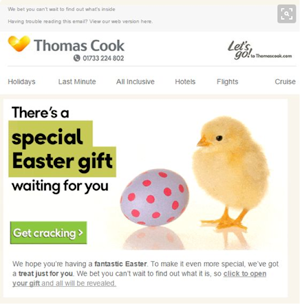 So, although Thomas Cook haven’t directly advertised Easter holidays, they’ve used this as an opportunity to treat their customers and gain some loyalty. A coupon in the email might have worked even better, because research shows that once shoppers receive their gift they become more reluctant to give it up. People love a bargain, so Banana Republic gave them some. As well as hiding eggs on their site in a fun engaging Easter egg hunt, they also gave an extra 40% off purchases with a coupon code! They could even have linked these two, by using a cascading coupon where the value increased with each Easter egg found. I co-founded Fresh Relevance (originally called Triggered Messaging) in 2011 and we have built a new real-time engagement marketing platform. We integrate websites with digital marketing and boost revenue with highly personalised experiences across channels and devices. Monday, 14 March 2016 Great Easter Campaigns for Companies who don’t sell Chocolate!